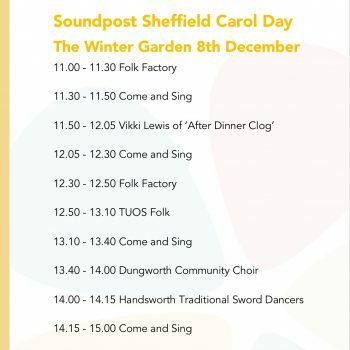 We’ll be in the Winter Garden this Saturday to celebrate the festive season with performances from our Folk Factory Groups, Dungworth Community Choir, singing sessions led by Manny Grimsley and accompanied by Simon Dumpleton and much more! With free Carol booklets, there’s no excuse not to get involved! Check out the schedule for the day and pop along!